This six part program is designed to support yoga teachers to enrich, refine and elevate their teaching so their authentic voice shines with confidence, authenticity and power. Expect to explore your values and discover your unique message, enhance your teaching methodologies and integrate philosophies that will best support the next phase of your personal and professional life. Immerse into six personal mentorship sessions with Lauren including (and not limited to!) Yoga philosophy, teaching methodologies and coaching to help guide you. Experience a unique and personalised curriculum tailored to your specific needs, desires and current phase of teaching. Gain clarity, inspiration and accountability to take the next steps in your teaching path! Get ready to illuminate your inner teacher! 6 personalised 75 minute sessions to enrich, refine and elevate your potential and purpose through the lens of teaching yoga — in person or virtually. 6 corresponding worksheets, exercises and resources for further studies. Feedback on two classes with 3-5 focal points for refinement. Next steps moving forwards for your personal and professional life based on your personal Dharma. Access to exclusive Kula offerings and consultations only available through this program. Bonus worksheet on intentional branding to create a business from the heart. studentship is key for our individual growth and the collective awakening! The role of a yoga teacher requires healthy and consistent studentship, on and off the mat. Mentorship is one of the most important (and often forgotten) aspects of learning. Through a close mentorship for the last five years with my teacher, I have personally experienced the direct impact on my Sadhana and ability to teach effectively and from the heart. A mentorship is personalised and will support you to step into your highest Self as a student, teacher and leader. 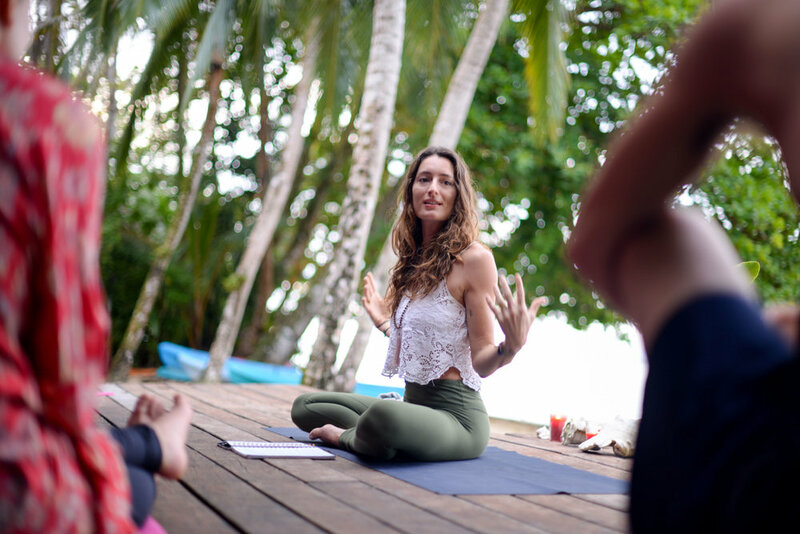 Whether you are interested in refining your teaching methodology, looking to build your brand, lead your first workshop or international retreat (or all of the above!) a mentorship will guide you to move forwards on your teaching path in ways that are skillful, potent and authentic. I have been a dedicated student on the path of yoga since 2007 and teaching regularly since 2011. My diverse experiences from teaching in multiple international settings (studios, retreat centers, ashrams, teacher trainings and school systems) and to a vast demographic of students (beginners, advanced teachers, kids and specialised populations such as athletes) has given me a unique ability to skillfully share the teachings in ways that are accessible and inspiring to multiple demographics. My entrepreneurial approach to creating a business from the heart has given me various skillsets on how to sustain a lifestyle that is in alignment with my values and intentions. I am passionate about connecting with other like-hearted, passionate teachers/healers/leaders and believe we all have a unique gift to share. As I’ve learned along the way through my own mentorship to my teacher(s) it’s through a supportive container of methodologies and the loving encouragement to share our authentic voice that we step into our purpose and power! I believe that everyone deserves to be elevated and empowered…and it’s my greatest honor to serve those who are serving the world. My experience of mentorship with Lauren Lee was magical. Lauren created a beautiful shift in my ability to take on the roll as a student, honoring exactly where I was at and creating a loving space to build on that foundation. Through Lauren's guidance I have learned how to connect deeper with my students to create a practice that flows more intelligently through language refinement, proper alignment, body mechanics, and creative theming. Lauren has the wisdom of a woman many years older. She is a teacher who knows the value of studentship at all stages. I cherish the time we have spent together during my mentorship and Lauren continues to support me to this day. I'm ready to ILLUMINATE MY TEACHING! What are the benefits of a personalised mentorship? Investing in our education is vital for our teachings to flow with ease, clarity and truth. With thousands of trainings and teachers worldwide, continued education is at the heart of any experienced and embodied teacher. A personalised mentorship creates a platform for greater depth within Svadhyaya, the study of Self. I meet you where you are at and challenge you to lovingly step into the next phase of your evolution. You will be supported through personalised attention and specific tools to help refine in ways that are specific to your strengths and needs. I vow to inspire and empower, ultimately guiding you to awaken your potential and power so your voice and projects are cultivated from a place of alignment to your personal Dharma. Working 1:1 is an incredible way to integrate concepts and ignite deep growth. The curriculum is designed to transform, elevate and enhance your personal and professional life! Why mentor with Lauren lee? I have been fortunate to be in close mentorship with my two dearest teachers throughout my yoga journey — experiencing first hand the power of this intimate work. I have been a practitioner for over a decade and teaching since 2011 within various platforms (teacher trainings, retreats, studios, specialised populations, online) and have created a self-sustaining business that is aligned with my values, mission and vision. I feel especially draw to work with teachers, those who are ready to step into the fires of alchemy for the benefit of the collective rising! 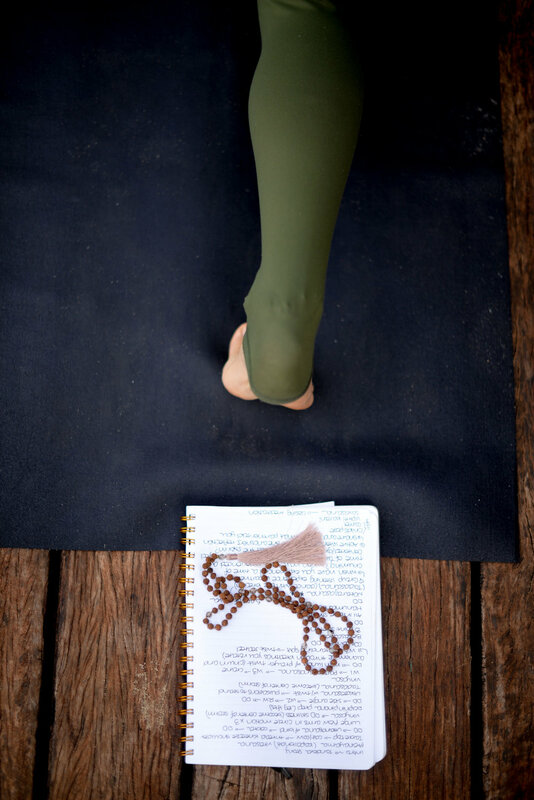 Ultimately, I envision a world where everyone practices yoga off the mat to create harmony and healing throughout the planet — and I believe it all begins with a teachers ability to accessibly translate the teachings in a way which inspires students. I know that working with teachers is a great responsibility — I am completely honored and grateful to support others in deepening their teaching path and cultivating more presence and power. do i have to be a yoga teacher to do this mentorship? Yes, this specific curriculum is designed for yoga teachers who have completed at least 100 Hours of an integrated Yoga Teacher Training. If you are not a yoga teacher, please review the mentorship package Commit to Courage to receive support on your path in a way which is most aligned. how long does it take to complete the mentorship? Depending on your learning style, the curriculum can take anywhere from three months - six months to complete. Ideally, it’s completed within six months to encourage integration of the materials. The mentorship is $750, or three payments of $250 within 6 months. Still have questions? Fill out the form below and get in touch. Thank you! I look forward to connecting further. Expect an email back within 72 hours.